The Mission II is the same as the Mission I, only the upper area is vertical mullions with no veneered panel and prepped to accept your glass insert. Top opening is fixed at 6-5/8″ high. Framing width is 2-3/4″. 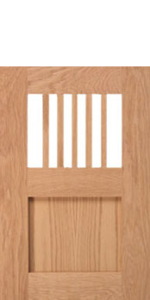 Quarter Sawn Red or White Oak are great species selections for this door. Be aware that the actual number of mullions will vary depending on the door width. This is a great accent door for certain areas of the kitchen. Quarter Sawn Red or White Oak is a great choice for any of the Arts & Crafts doors.